Steven (Chicagoland, United States) on 7 February 2018 in Landscape & Rural and Portfolio. Residence nestled along the Chena and Tanana Rivers as seen from the Riverboat Discovery in Fairbanks, Alaska. Photo captured September 10, 2015. No wonder it's my favorite time of the year, Steven! The autumn is one of four beautiful season. Such wonderful color and well framed composition. the house looks very cozy nestled there. Magnifique les couleurs qui entourent ces demeures. Une très belle photo d'automne ! Wow . . now, that sure is some 'setting' ! This house is well described in your description. It's a fine autumn scene. Excellent outumn olurs! Love it! de superbes couleurs automnales Steven. J'adore , vraiment de belle couleur d'automne avec une belle vue. Those who live in such a place, surrounded by nature, have the obligation to be happier than the rest of us. Wonderful colors . Superb composition . 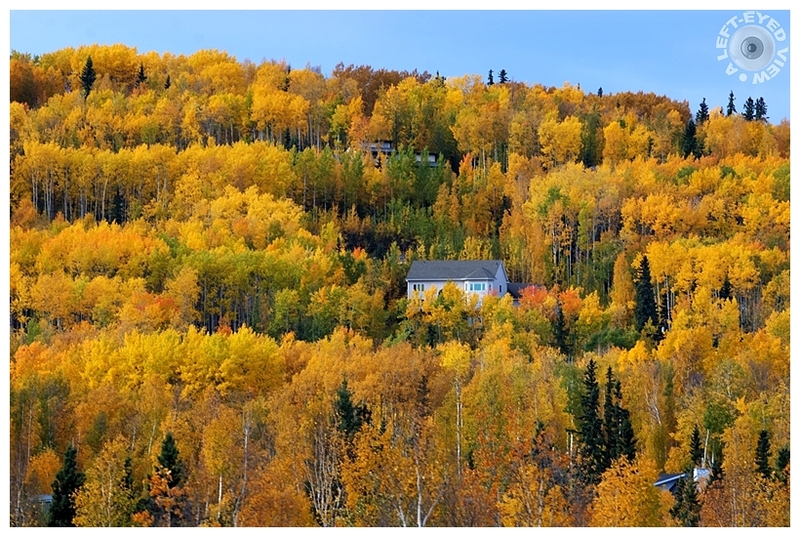 A gorgeous image of the golden trees and the nice house. it would be great to walk to your window and see this bright splash of color. Absolutely beautiful ! A superb exposure and my idea of getting away from it all. wow what a splash of gold here !! Love this image !! !